UPDATE: Apparently the deal with Colorado fell through and Stamler has instead been signed by the Las Vegas Wranglers of the ECHL. Another key member of the Varsity Reds is moving on. The Sports Corporation's Facebook page is reporting that client and UNB defenceman Bretton Stamler has signed with the Colorado Eagles of the ECHL. Stamler, a 2005 7th round draft pick of the Detroit Red Wings, joined the Varsity Reds prior to the 2008-09 season after playing 5 seasons in the WHL for Seattle, Edmonton, and Swift Current. The native of Edmonton, Alberta was perhaps one of the most underrated players on the team during his 4 seasons at UNB as he was a smart, solid, defensive defenseman, who quietly went about his business without much fanfare, while also providing offense and delivering a big hit when the opportunity presented itself. An assistant captain this year, Stamler put up 41 points during his first three seasons before collecting a career-high 8 goals and 20 points this past season. His +32 rating was tops in the AUS. He was a member of the 2008-09 AUS all-rookie team and has been named an AUS second team all-star in each of the previous 3 seasons. He helped the V-Reds win a national championship in both 2009 and 2011. The Eagles went 37-27-1 this season, finishing in 2nd place in their division and 4th in their conference. They open the playoffs on March 30th. While the departure of Luke Gallant and Jonathan Harty were expected this one is a bit more surprising and means the Varsity Reds will have a drastically different looking defence next season. They will be looking to replace three guys who were among the top four scoring defencemen in the conference and accounted for 20 goals and 53 assists. The Rochester Americans, the AHL affiliate of the Buffalo Sabres, have signed Kyle Bailey to an amateur tryout the team announced today. Bailey will join the team for the remainder of the season. What else can be said about the Ponoka, Alberta native during his 5 years as a Varsity Red? After spending his junior career with Portland and Lethbridge of the WHL his arrival before the 2007-08 season coincided with the V-Reds rise from being an above average team - remember that although UNB were the defending champions that was their first appearance at a University Cup they didn't host since the 1999-2000 season - to a national powerhouse. He finished his career as the 3rd most prolific scorer in UNB history and averaged at least one point per game every season, was arguably the league's best face-off man, and was a top penalty killer. He was part of 5 straight first place AUS finishes, two record breaking regular season teams (2007-08 and 2009-10), two CIS championship teams (2009 and 2011), a 2nd place squad (2008), is on track to become a 5-time academic All-Canadian, and was recently named the 2012 Dr. Randy Gregg Award winner which recognizes leadership, academics, and community service. His leadership and passion were off the charts and he always seemed to rise to the occasion, as evidenced by his two overtime AUS championship clinching goals, in 2008 against SMU on a penalty shot and in 2011 in the deciding game against St. FX, that most of us won't soon forget. Simply put, he leaves UNB as arguably the greatest captain in team history. University of New Brunswick defenceman Jonathan Harty has signed with the Kalamazoo Wings of the ECHL, according to the team's official website. He seen action in the Wings 6-1 victory last night, picking up a fighting major in the game. Kalamazoo is an affiliate of Vancouver and New Jersey of the NHL and Albany of the AHL. Harty, a native of Oromocto, joined the Varsity Reds prior to the 2008-09 season after spending his entire four year junior career playing for the WHL's Everett Silvertips. He quickly became a fan favourite for both his physical play as well as his penchant for joining the rush. This past season was Harty's best in his four years at UNB as he registered a career-high 7 goals and 20 assists. His 27 points placed him 2nd among all AUS defenceman and his +23 rating was second overall in the league. For his efforts Harty was named an AUS first team all-star and a CIS second team all-star. He was also the only UNB player named to the all-tournament team at last week's University Cup. During his time at UNB the Varsity Reds captured CIS Gold in 2009 and 2011. While this is not surprising news, given Harty finished his MBA this past year and was only ever expected to stay at UNB for four years, it does mean that the Varsity Reds will be looking to replace 2 of the top 3 scoring defencemen in the conference this summer (Luke Gallant being the other). "You may not think about it, but athletes are still human"
Winning was a requirement or everyone jumped on them. Not only did they expect to be victorious, but I expected it, the media expected it, the community expected it...The Fredericton community seemed to believe the only thing the team could do was win a national championship...When that didn’t happen the men on that team did not know how to respond. They were broken. They let down themselves, their coach, their school, and their city. He goes on to compare the situation these student-athletes face with that of other amateur athletes in this country, notably the World Junior hockey team and Canadian curlers. We expect them to handle the pressure of an entire city or country and if they don't win gold it is considered a failure but, as Cameron concludes, we need to remember that these athletes are just normal people like the rest of us and not superhuman. There is plenty to talk about as the offseason officially begins today. Here is what graduating players Kyle Bailey and Luke Gallant, as well as head coach Gardiner MacDougall, had to say in the wake of the team's 3-2 to Western on Saturday afternoon. All quotes from the March 26th edition of the Daily Gleaner unless otherwise stated. "It’s tough right now. Obviously, we’ve done some incredible things over the past five years and one of those things has been you develop an expectancy. I’m sure that there are lots of teams out there that are dancing around happy that we lost right now but in our dressing room we expected to win. It didn’t happen today…it’s disappointing and I’m not sure I have an answer." "The big thing it comes down to at this time of year is execution and when you look back at the game, personally, I just feel like I didn’t execute well enough. You look around the (dressing) room and it hurts. Like Kyle said, you’re expected to win here. When you don’t, you haven’t completed your objective." "It's just difficult to sit next to these two guys (Bailey and Jordan Clendenning)...you develop friendships and, looking around the (dressing) room, it hurts." "We’ve had an unbelievably positive experience at CIS Nationals but if you go to the CIS Nationals’ well enough times, you’re going to have some heartbreaks. That’s life in CIS hockey." "Kyle will be one of the legends of our program. No on who’ll put the red and white on will be more passionate about being successful at UNB. Kyle’s been amazing. He’s overachieved here. His legacy will live on here as long as anyone in that room is still playing, because he brought so much to the group. And every player who played under him will bring some of that Kyle Bailey passion." "The recruiting will start tomorrow (Sunday) for us - we start a day early this year - if we can get him (4th year forward Jordan Clendenning) into our MBA program, because he brings so much passion and leadership"
Some stories on this Monday afternoon as the McGill Redmen celebrate their first University Cup championship. Darren Zary for Postmedia News, via the National Post - "McGill wins first men's hockey title"
The Canadian Press, via the Globe and Mail - "McGill stops Western for CIS men's hockey crown"
K. Bryannah James for UNB Sports Information, via UNB Athletics - "McGill Redmen make history"
Darren Zary for the Star Phoenix - "University Cup full of strange twists"
Darren Zary for the Star Phoenix - "Saskatoon gets ready to host tournament"
5th year captain Evan Vossen of Swift Current, Saskatchewan scored 6 minutes into overtime to give the McGill Redmen a 4-3 victory over the Western Mustangs, and the first University Cup in school history, tonight at the AUC. The Redmen avenge their loss in last years championship final. - Benoit Levesque (2) and Nicolas Binek also scored for McGill while Keaton Turkiewicz (2) and Kevin Baker replied for the Mustangs. - The game was tied 1-1 after the first period and McGill held a 3-2 advantage after two. The Mustangs would tie the game with a power play goal by Turkiewicz at 13:18 of the 3rd period, only 32 seconds after eventual tournament MVP Francis Verreault-Paul received a 5 minute major and game misconduct for charging Mustangs goalie Josh Unice. - Shots in the game favoured McGill 42-22. - Josh Unice made 38 saves in the loss while Hubert Morin stopped 19 to get the win. - Levesque and Turkiewicz were the players of the game for their respective teams. - A big "thank you" goes out to the UNB organizing committee and all of the volunteers who have helped put on a top-notch event the past two years. The tournament heads to Saskatoon in 2013 and 2014. - Only 6 more months until hockey season. For the first time since Western defeated UQTR in triple overtime in the 2002 final the CIS Gold Medal Game will be an all OUA-affair. The OUA West champion Western Ontario Mustangs, fresh off a 3-2 OT win against UQTR on Friday and a 3-2 win over UNB yesterday, will meet the OUA East champion McGill Redmen, 6-3 winners over Moncton on Thursday and 4-3 losers against Saskatchewan yesterday, in a rematch of the 101st Queen's Cup that determined the OUA champion earlier this month. McGill emerged victorious in that game, 4-1, and have won four consecutive meetings between the two teams dating back to a 2-1 loss to the Mustangs in the 2009 Queen's Cup. The Redmen are 15-13-1 all-time against Western. - McGill is seeking their first championship in school history while Western is looking to capture their second. - UQTR is the last OUA team to win the CIS title, defeating St. FX 3-0 in the 2003 finals (a game that was also at the AUC). - If you can't get to the game it will air live on Sportsnet at 8 PM AST. Some links of interest on this final day of the CIS hockey season. Chronicle Herald - "CIS hockey final to be Ontario affair"
Darren Zary for Postmedia News, via Canada.com - "Western upsets UNB to advance to University Cup final"
Canadian Press, via Toronto Star- "Western Mustangs to face McGill Redmen in CIS men's hockey final"
Darren Zary for the Star Phoenix - "Hockey dogs beat out McGill, fail to advance to final"
Kevin Menz for The Sheaf - "Huskies win final round-robin game at University Cup, not enough to land a spot in final"
K. Bryannah James for The Brunswickan - "Western knocks off top-seeded Varsity Reds"
After ending the Western Mustangs season in two of the last three years it just wasn't meant to be for the hometown tournament favourite University of New Brunswick Varsity Reds this afternoon at the AUC. The Mustangs accomplished something that no OUA team has in 9 years and that was beating UNB on home ice, coming away with a 3-2 victory that moves them on to the championship game tomorrow evening against the McGill Redmen. It also marks the first time Western has ever defeated the V-Reds. The Mustangs jumped out to a 3-0 lead after the first period as they received goals from Domenic DeSando at 12:25, a 5-on-3 power play goal by Keaton Turkiewicz, and a shorthanded goal by Jason Furlong. UNB goalie Travis Fullerton didn't give up anything the rest of the way and stopped a number of high quality chances by the Mustangs as the Varsity Reds started taking more chances in hopes of generating some offense. Western held onto the three goal lead until the third period when UNB would battle back like we have seen them do so many times over recent years. The Varsity Reds finally got on the board on the power play at 12:33 of the period when Kyle Bailey got the puck in the slot, had his stick break on the shot attempt, but got a fortuitous bounce as the puck went right to Jonathan Harty at the side of the net who flipped it past Josh Unice. UNB would bring the sold-out crowd to its feet once again just under four minutes later with another power play marker when Bailey finished a nice passing play by Tyler Carroll and Chris Culligan, taking the puck in almost the exact same spot as earlier and slapping it into the empty cage. The Varsity Reds pulled Fullerton with over a minute to go and had a number of great chances in the dying moments but were unable to get the equalizer past Unice, who was spectacular in the Mustangs goal, stopping 18 shots in the period and 36 in the game. - Shots favoured UNB 38-24. - UNB went 38-25 in the face-off circle. - Players of the game were Unice for Western and Bailey for UNB. - Thomas Nesbitt and Ben Wright were back in the line-up, replacing Stefan Salituro and Spencer Corcoran. 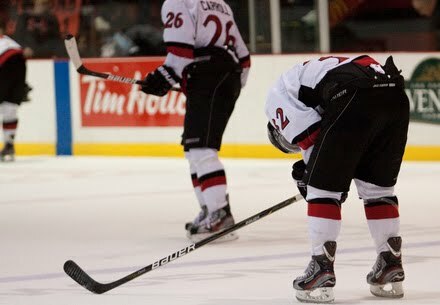 - The loss snaps UNB's 7 game winning streak at the University Cup. Their last loss was to Alberta in the 2008 championship game. - This is the first time in their last six trips to the University Cup they will fail to reach the finals. They won gold in 2007, 2009, and 2011. They were the runner-up in 2004 and 2008. - The loss was also only UNB's 4th at the AUC in their last 48 games against CIS teams over the past two seasons. They are 26-2 in the regular season, 8-1 in the playoffs, 4-1 at Nationals, and 6-0 in exhibition games during that span. - So while the season ends two wins shy of the ultimate goal the Varsity Reds still gave us a great season that was successful in many other respects. They won 20 games and finished atop the AUS regular season standings for the 5th straight year as well as won the AUS Championship, which should not be discounted as it is certainly not an easy task. There are many positives that came out of the season that the team can build off of going forward. - Although their university careers end on a bittersweet note 5th year seniors Kyle Bailey and Luke Gallant can take some solace in the fact that they were a big part of arguably the greatest 5 year stretch in UNB hockey history. They both end their careers with 2 CIS Gold Medals, 3 AUS titles, and 5 regular season titles (including the two greatest regular seasons in AUS history). It has been a pleasure watching them the last 5 years and it will be almost impossible to replace two of the greatest players to have ever worn the red, white, and black. We wish both of them well in their future endeavors. Number 1 hosts number 4 – The final round robin game of the 2012 Cavendish University Cup is scheduled for 4:30 PM this afternoon at the Aitken University Centre and a trip to the CIS Gold Medal Game is on the line. It will feature the AUS Champion and CIS #1 ranked UNB Varsity Reds playing host to the OUA Runner-up and CIS #4 ranked Western Mustangs. The Varsity Reds overcame a rash of injuries to finish the season on top of the AUS for the 5th straight season with a 20 – 5 – 3 record in conference play. It also marked the 5th straight year UNB has won at least 20 games. They held the top spot in the CIS rankings 15 times, were 2nd twice, and 3rd once. The Mustangs finished in first place in the OUA West division, and second in both the OUA conference and CIS behind only McGill, with a 21 – 4 – 3 record, 7 points ahead of 2nd place Lakehead. It marks the 3rd consecutive year they have won their division. Western was ranked in the CIS top ten for all 18 polls this season, ranking 1st on one occasion and in the top three 6 other times. In their first game on Thursday night the Varsity Reds defeated the UQTR Patriotes 6-1 and last night the Mustangs eliminated the Patriotes with a 3-2 overtime win. This means that for the second year in a row UNB and Western will be playing in a true semi-final, with the winner advancing to the championship game on Sunday night. Last Meeting – The last meeting between these two teams was in the semi-finals at last year’s University Cup. UNB scored three 3rd period goals to pull away with a 4-0 victory. Special teams were the story as the Varsity Reds scored two power play goals, a shorthanded goal, and killed off all 11 Western power plays. UNB would go on to win their 4th National Championship the next night. The only two other times the Varsity Reds and Mustangs have met have also been at Nationals. In UNB’s first game at the 2000 University Cup in Saskatoon UNB beat Western 3-2 thanks to an overtime goal by Colin Beardsmore. Then, in the 2009 National Championship Game in Thunder Bay the Varsity Reds received a hat-trick from tournament MVP Lachlan MacIntosh to defeat the Mustangs 4-2 as UNB claimed their 3rd CIS Gold Medal. Who to Watch for on UNB – The experienced Varsity Reds feature 18 players who have won a National Championship and 8 players who will be appearing in their 3rd University Cup. The team’s strength offensively is their depth as 7 players accumulated more than 20 points this season, led by 5th year captain and AUS second team all-star Kyle Bailey (33 points) and Chris Culligan (30 points in 24 games). Culligan led all AUS players in playoff scoring with 13 points in only 6 games while Bailey was second on the team with 8 postseason points. They have also received big contributions from first year players as well, most notably AUS all-rookie team member Tyler Carroll (15 goals, 26 points), Thomas Nesbitt (21 points), and second half addition Shayne Wiebe (12 points in 11 games). On defence UNB may be the most dangerous team in the nation at generating offense from their back-end as AUS first team all-star and second team CIS all-star Jonathan Harty (27 points), 2011 Nationals MVP Luke Gallant (26), and AUS second team all-star Bretton Stamler (20) ranked 2nd-4th among all AUS defencemen in scoring. Despite battling multiple injuries mid-season goaltender Travis Fullerton finished the regular season with an 11-0-1 record, 1.67 GAA, and 0.909 save percentage in 13 games. He continued his strong play in the playoffs, going 6-0 with a 1.82 GAA and 0.917 save percentage, and notching a shutout in the series clinching game in the AUS Finals. Who to Watch for on Western – The Mustangs had a quartet of players score more than 30 points this season, led by CIS top scorer, CIS first team all-star, and OUA West MVP Keaton Turkiewicz (47 points). Second team all-star and veteran Kevin Baker (37 points), CIS rookie of the year Zach Harnden (17 goals, 31 points), and Steve Reese (13 goals, 31 points) will also be counted on for offense. These four players also led the Mustangs in playoff scoring, with Turkiewicz pacing the conference with 14 postseason points. Defensively, OUA West defenseman of the year Scott Aarssen only had 8 points this season but he will almost certainly be relied on to shut down the explosive UNB attack. Rookie Andrew Eastman led all Mustangs blueliners with 17 points in 25 regular season games before adding another 4 in 8 postseason contests. Fellow rookie Matt Ashman was the only other Western defenceman to reach double digits in scoring, notching 1 goal and 9 assists. In goal will be OUA West goaltender of the year and first team all-star Josh Unice. Unice started 18 games this season and registered 15 wins, a 2.10 GAA, and 4 shutouts. His 0.931 save percentage ranked 2nd in the CIS.